I got this question and wanted to share the answer here for the benefit of others with the same question. "I have a question regarding the zoom function in AutoCAD 2006. In versions past when you would zoom and pick your objects the zoom would be instantaneous. Now it gradually zooms in and out. I move very fast in AutoCAD and this definitely slows me down. Do you have any idea how to turn this function off? I have searched the help files and the pamphlet that came with my cd and to no avail. I hope you don't mind taking the time to help me with this. Thanks in advance for your help!" This is one of the most visible changes when you start using AutoCAD 2006. Maybe you like it, maybe you don't. This setting is not in any menu and you might not know what to search on but here you go. The command that opens the dialog box you see here is VTOPTIONS. There are also system variables available. VTENABLE - Controls when smooth view transitions are used. Default value is 3 and any value between 0 and 7 is valid. Look for vtenable in the help for more information on it. VTDURATION - Sets the duration of a smooth view transition, in milliseconds. 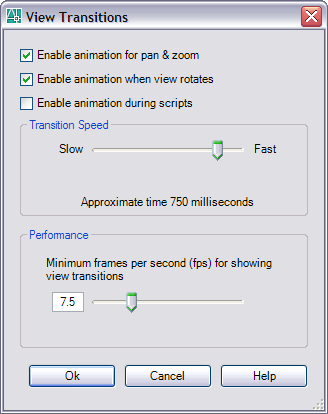 VTFPS - Sets the minimum speed of a smooth view transition, in frames per second.